At my school in Colombia, we had a daily Drop Everything And Read time. When I get my hands on a new book by Sarah Dessen, I drop everything and read until the book is finished. 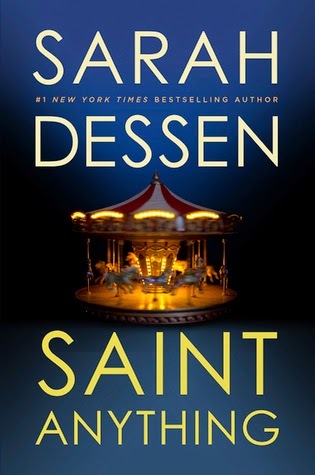 Even better when Saint Anything is Dessen's best book in years. Touted as being much darker than her usual work, Saint Anything tells the story of Sydney, who has always been overshadowed by her dynamic brother, Peyton. When Peyton's downward spiral ends with him in jail for drunk driving, Sydney becomes completely invisible, except to her new group of friends. I didn't find this book to be particularly dark, but the big difference is that Saint Anything doesn't mainly focus on the romance. It is Dessen, after all, so there is a romance, but the friendships are given equal importance, as well as the family dynamics. These aspects make it Sarah Dessen's most well-rounded book. If you read one Sarah Dessen book, you'll want to read them all. It feels so good to have new words from one of my favorite authors.